Although the B.R. Modernisation Plan of the 1950s did not feature many type 3 designs, after gaining experience with the heavier EE type 4’s (later class 40), and the B.R.Sulzer ‘Peaks’ (later classes 44,45,46), a decision was made to build a more versatile, medium power, medium weight locomotive for mixed traffic requirements. 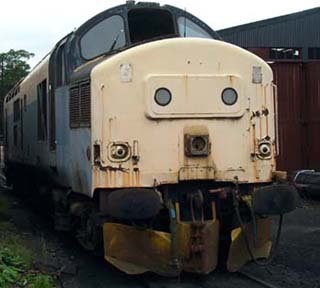 Therefore, on 20th November 1960, the first EE type 3 locomotive (later class 37) was rolled out of the English Electric Vulcan foundry Works at Newton-Le-Willows. A considerable saving in weight was achieved by the fitting to the locomotives of the then recently introduced 12 cylinder English Electric 12CSVT diesel engine. This engine was only unveiled by EE in 1960 and was first used in a small batch of locos for East African Railways and was rated at 2025hp. 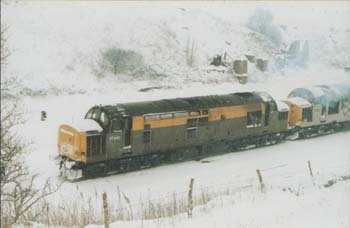 This was just over the 2000hp which was available from the much larger 16 cylinder EE16SVT unit which was fitted the the EE type 4’s (class 40s ). However, B.R. did not require 2025hp in their new build of loco’s, so the power unit was de-rated to 1750hp. This would ease the burden of maintenance somewhat and would allow the unit to operate well within its capabilities. At the time, B.R. had probably little idea of how reliable this engine would be in this de-rated form. And so, four years later in October 1964 locomotive D6940 entered traffic fresh from Vulcan Foundry. Its first allocation was to Worcester but the loco was quickly sent on to Cardiff Canton within a couple of months. There she stayed until late 1967 until a change of scenery came when a transfer to the Yorkshire depot of Healey Mills took place. The loco was re-numbered to 37240 in early 1974 and later on found itself going ‘home’ to Wales at the end of the year, finding itself not at Cardiff, but this time at Landore, being utilised heavily on South Wales’s various freight traffic workings. Such a working is shown here, courtesy of Bruce Galloway, who took this superb and now very evocative image of a work-stained BR blue 37240 drifting through Cardiff with a coke working in July 1982. Give it another couple of harsh Welsh winters and 6940 will be looking like this – no bad thing! Cardiff Canton managed to get the loco back in 1983 and in 1988 the loco was sent far away to the Scottish depot of Eastfield for a year, then back to England at Thornaby in early 1989, back to Eastfield in 1990 and even further North to Inverness in 1992. A large amount of passenger mileage could be had behind the loco at this time, the machine seeing regular use in the Highlands of Scotland, particularly in the Summer months. 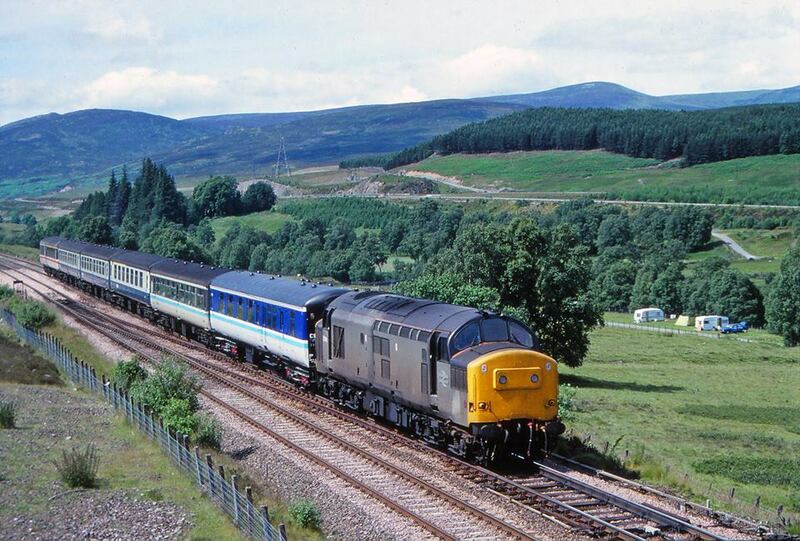 Andrew Donelly’s camera captured two such workings on July 16th 1990, where 240 is seen calling at Kingussie on a northbound sleeper train, covering for a failed 47. She then returned South later that day on the 12:30 Inverness-Glasgow QS and is seen at Dalnacardoch with a suitably motley liveried rake of stock. Those were the days! The call of Motherwell depot was answered in 1994, and a year later saw the loco return to England at the Black Country depot of Bescot. Now allocated to the Transrail freight pool, the machine stayed in the Midlands for a further two years before moving to Crewe Diesel depot. The loco was now stored unserviceable, having suffered a camshaft defect whilst in service causing damage to ‘A’ bank camshaft and bearings. 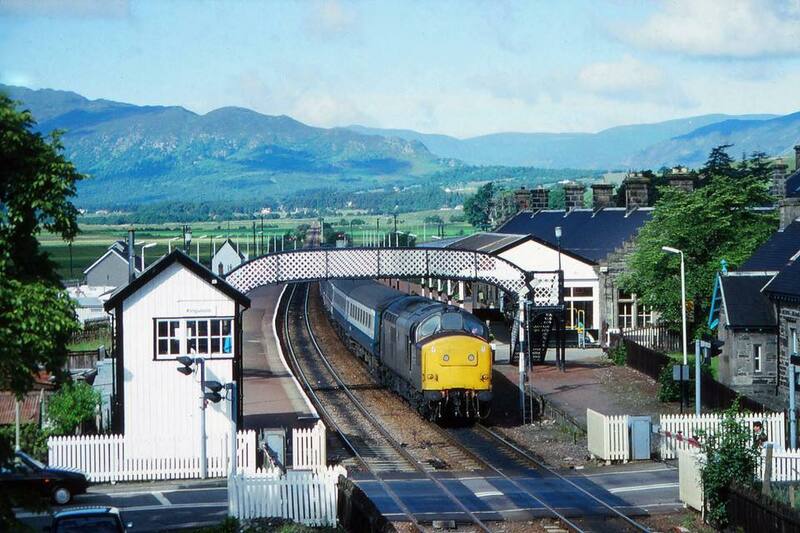 37240 at Peak Forest (above) and at Northwich (below) during a stint on the Tunsted-Northwich limestone traffic. Photos courtesy of Martin Corbett from the old LDG site. 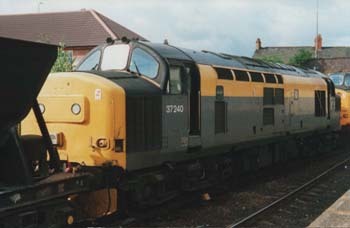 Unfortunately, 37240 was condemned and sent for component recovery at Wigan CRDC in 2000. The main components that were utilised for other surviving class members were the bogie equalising beams from number 2 bogie. These obviously falling foul of the EWS class 37 bogie scare that occurred, following the failure of the aforementioned beams on a sister loco whilst crossing the Menai Bridge in Wales at that time. The loco arrived at Llangollen in July 2002 and into our care and ownership shortly afterwards. A full appraisal of the locomotive was made, the most notable work required being, 1) The fitting of a replacement bogie at number 2 end. 2) Camshaft repairs and replacement of a few missing parts on the power unit. 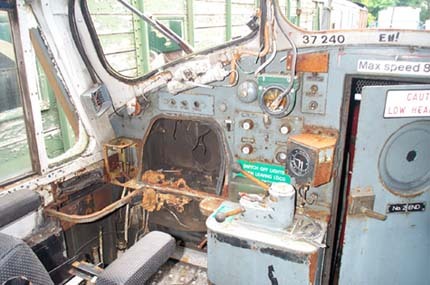 3) Total re-building of both cab interiors including the totally rotten cab floors at both ends. 4) Un-seizing the parking brake mechanisms at both ends that had rusted solid. 5) Replacing a couple of small items in the electrical cubicle. 6) Re-glazing and bodywork repairs. The loco was started up for the first time in preservation in early 2003 and ran under its own power shortly afterwards. It was given a fresh coat of ‘Dutch’ civil engineers livery. Since rentering traffic 10 years ago, 37240 has become a firm favorite amongst LDG members and enthusiasts alike. She has been extremely popular at our running days and diesel galas, as well as on driver experience courses. Hearing her in full cry as she tackles the steep climb off Berwyn Bank which continues right through the single bore Berwyn tunnel is something that every 37 fan should make sure they experience at least once in their life! Since then, 37240 (or 6940, the late 60’s number she currently runs with) has added another operational decade to her life and will soon celebrate her 50th Birthday – no mean feat for a machine designed with a 25 year life span. See the loco’s homepage and our blog for more information about what she’s currently up to.